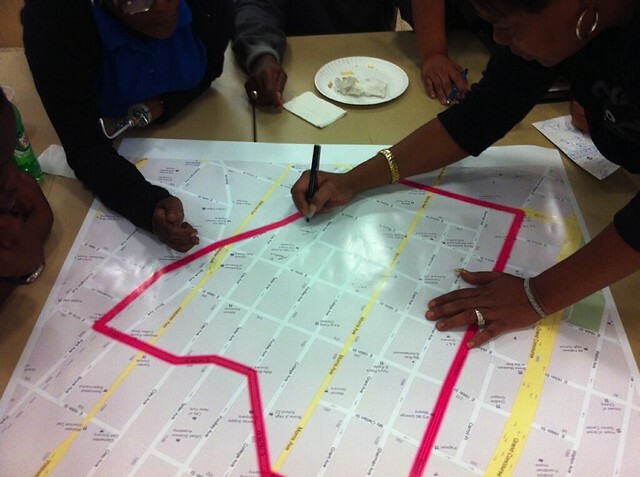 Public Science Project team engaging in mapping exercise as part of the Morris Justice Project. Photo Credit: Flickr/ Public Science Project. The Community Innovator’s Lab (CoLab) is hosting a weekly Participatory Action Research (PAR) speaker series on Thursdays from October 15th – November 19th, 2015 from 5:00-6:30 PM in Room 9-451. PAR is a collaborative approach to inquiry, scholarship, and social justice in which the boundaries between “subjects” and “researchers” are blurred. The subjects are no longer objects and become partners in the research process, which includes selection of the research topic, data collection and analysis, as well as decision-making about what action should happen as a result of the research findings. Since PAR values situated knowledge and lived experience, innovative research methods outside the standard scientific framework are crucial to obtaining and analyzing information. In this series, we will explore how different individuals and organizations are practicing elements of participatory action research in their work to fight for labor rights, promote economic democracy, and organize against racial discrimination in the United States and abroad. Furthermore, we will learn about creative methods to capture and disseminate knowledge with the aim of advancing social justice. Summaries of these talks will be published on CoLab Radio after each session. “My struggles with learning English and growing up in a poor immigrant farm worker family became the foundations of language, labor, and immigration issues that I passionately took up in my organizing, teaching, and research as an activist intellectual in academia, ” explains Dr. Calderon. Through scholarship and organizing, he helped defeat an English Only movement in the city of Monterey Park, assisted farmworker unions, and has built long-lasting partnerships between communities and higher education institutions. While many academics enter communities unlike their own for the purposes of PAR, Dr. Calderon already belonged to the immigrant networks and places in which he wanted to fight for civil rights. In this session, Dr. Calderon will discuss his newly published book, Lessons from an Activist Intellectual: Teaching, Research, and Organizing for Social Change. He believes that those who experience injustice have the knowledge needed to fight oppression. Cory Greene is a formerly incarcerated PhD student at the Graduate Center of CUNY where he works closely with the Public Science Project. The Public Science Project engages in Critical Participatory Action Research (CPAR), a theoretical, epistemological, and ethical commitment of accountability to those most closely related to, and affected by, the issue(s) under study. CPAR assumes new knowledge is produced when academic and non-academic researchers collaborate and share expertise in every stage of the research process – from research design to presentation of findings. Cory Greene will present on his experiences as a researcher / student / activist on multiple CPAR projects that sit at the intersection of race, class, education and the criminal punishment system. He will discuss his relationships to the communities he collaborates with, and how they co-create knowledge. Come prepared to ask questions and learn about the way different PAR methods can advance social justice. Katherine Shozawa is a Canadian interdisciplinary artist, educator and curator who blends community engagement with contemporary art practice. Most recently, she was an artist-in-residence with the Philadelphia Mural Arts Program exploring the textile industry’s past and present in the city. She has also designed several participatory exhibitions about Japanese internment during World War II in the U.S. and Canada. Catherine D’Ignazio is an artist and assistant professor of Data Visualization Storytelling and Civic Media at Emerson College. Her projects combine the visual arts and technology to engage viewers in new ways. Researchers use a wide variety of social science methods for learning about cities and the communities within them, but many of these traditional means ignore alternative forms of knowledge. Katherine Shozawa and Catherine D’Ignazio will discuss how critical information cannot always be captured through these conventional practices. Aesthetics present a completely distinct realm of inquiry and knowledge-creation, a way of creating familiarity with and empathy for realities not captured by familiar forms of data or comprehended by scientific explanation, particularly those involving conflicts of culture, identity, and experience. Disciplines such as fiction writing, film, photography, music, and sculpture can help us know places and people better, as well as facilitate connection and understanding between individuals. PAR scholarship is often enriched by these other ways of knowing, communicating, and disseminating knowledge. Dr. Kaufer and Lily Steponaitis are working with CoLab’s 2015-16 class of Mel King Community Fellows and the Global Alliance for Banking on Values (GABV) to produce an MITx Massive Open Online Course about values-based banking. They have been collaborating with the fellows, who work at GABV member banks, to research values-based banks around the world to better understand the key factors and best practices that support and drive these banks. The MOOC aims to critically document this growing global movement for more ethical and sustainable banking practices. The MOOC is also an opportunity to initiate and/or strengthen cross-network learning between GABV banks and the banking field more broadly. These presenters will discuss how to create diverse and effective learning communities at a large scale to share and produce knowledge for the purposes of advancing economic democracy. In this session, Alison Coffey and Jenna Harvey will share their experience working on a Participatory Action Research project with a group of young people from PalmasLab, an innovation space housed within Instituto Banco Palmas. Instituto Banco Palmas is a community development bank offering financial and other socially-oriented services in Conjunto Palmeiras, a neighborhood on the periphery of Fortaleza, Brazil. Over nine weeks in summer of 2015, through a partnership between MIT CoLab, PalmasLab, and the MIT Brazil program, Alison and Jenna collaborated with the PalmasLab team to design a research plan and methodology to explore PalmasLab’s question of how Conjunto Palmeiras residents experience, access, and engage with different material and immaterial “wealths” and “poverties” in their neighborhood. This project comprised part of a larger organizational aspiration to strengthen research capacity and legitimate knowledge production in the geographic and socio-economic periphery of the city. The presentation will highlight different elements of the research process in the context of CoLab’s approach to advancing inclusive development, including co-production of a research question and methodology, the translation of research results into meaningful action for the organization, and key challenges that emerged. They will also share insights and reflections from the team about the role of PAR within a community financial institution for imagining, theorizing and enacting alternative economies. The production of scholarly research can reflect the status quo and reproduce the inequities in society. Those with more education, more resources, and more power are inherently given the right to explain why the world functions in the way that it does. However, these explanations may be biased or even incorrect because they lack other needed viewpoints. Dr. Jones, the Director of Education and Leadership Development at 1199SEIU and Dr. Costanza-Chock, an associate professor at the MIT Center for Civic Media will discuss how PAR and the incorporation of different types of knowledge has fueled activism regarding labor rights in their own work. With the goal of achieving social justice, these activist scholars will explain what the “right to research” means and requires.